My name is Ashley Bivona and I love to help families plan magical vacations! I have loved Disney World since I was child and now my kids love Disney too! I am married with 3 children, who are 11, 8, and 5. I was born and raised in New Orleans, LA area. Three years ago, we moved to Key Largo, FL, and in a couple of months we will moving to Stafford, VA.
Have you ever been so excited and anxious about something that you can’t sleep? I have…every time I am going to Disney World. I pack a week early and can’t sleep the night before just wondering, “What is this trip going to be like?” I love that when I walk through those gates I forget about everything else in my life, it’s just my family and I in a world of magic, fun, and adventure. I love that each trip brings new excitement and memories for our family. Seeing the magic of Disney through my children’s’ eyes is amazing. Walt Disney was a man ahead of his time. His visions and goals for families to have fun together are wonderful. Unfortunately, times have changed and families spend less time having meals together and spend more time on their phones and playing video games. Vacationing at Disney gives families the quality family fun that they need. I have traveled to Disney World many times in the last 17 years. My husband and I got engaged in Disney World and we honeymooned on Disney Cruise Line. Why should you book with me? I have spent many hours researching Disney for my own trip planning. I have experienced special events at Walt Disney World like the Flower and Garden Festival, Food and Wine Festival, Mickey’s Very Merry Christmas Party, Mickey’s Not So Scary Halloween Party and the Pirate and Princess Party. I have traveled to Disney World with extended family, friends, large groups, and small children. I also have a child with special needs (Down syndrome) so I have experience with how to navigate the parks with a special needs child. 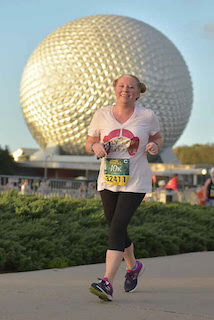 I also have participated in 2 RunDisney events as well as worked with clients who participated too. Disney is not your thing? No problem! I can help with many destinations and cruise lines. Some of these include, Universal Studios Orlando, Busch Gardens, SeaWorld, Legoland, Discovery Cove, Royal Caribbean Cruise Line, Sandals and Beaches Resorts….and the list goes on! Let me know where you want to go and I will do the rest! My goal is to help you have a magical vacation no mater where the destination is! Connect with Ashley on Facebook!